Companies in India are contending with a growing resource crisis: water shortage. With 54% of the country’s total area facing high to extremely high water stress, India is positioned to become one of the most water-stressed countries in the world. A combination of water-intensive agriculture, increasing industrialization, and business-as-usual approaches to water management has put the water supply in danger. In a report published by the Water Resources Group, the national supply is predicted to fall 50% below demand by 2030. But companies, government agencies, and other water users have a new tool poised to make a meaningful difference, the India Water Tool 2.0 (IWT 2.0). Today marked the launch of version 2 of this comprehensive, publicly available online tool. IWT 2.0 was created in partnership by the World Business Council for Sustainable Development (WBCSD), companies, research organizations, and industry associations. The tool is the most comprehensive freely available resource to help companies, government agencies, and other stakeholders identify their water risks and prioritize water-management sites. How many of my sites are in high stress regions? How many of my sites are in over-exploited or critical areas? 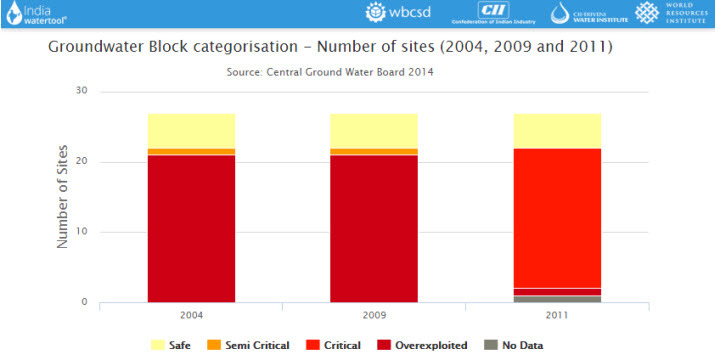 What is the net groundwater availability and projected demand for groundwater for my sites? Are any sites in areas where the concentration of pollutants are above permissible limits? The tool also addresses the shared risks between agriculture, industry, and domestic users. For example, of the 632 groundwater quality districts captured in the tool, only 59 meet Indian-government water quality safety standards. This equates to more than 100 million people living in areas of poor water quality. Among the 4,000 wells showing statistically significant trends, 54% have declined in the past seven years, and 16% have dropped over 1 meter per year. The map also shows a widespread pattern of high risk in Northwest India, a region where agriculture is a cornerstone of the economy. Producing 50% of the national government’s rice supply and 85% of its wheat, the area depends heavily on groundwater for these water intensive crops. IWT 2.0 is the first step for understanding water-related challenges in India and planning for long-term water management. Check out and explore the India Water Tool 2.0 today.